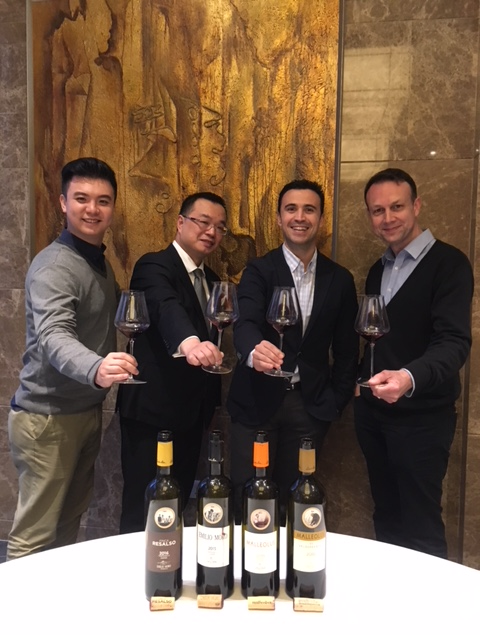 Nacho Andrès, Export Director of Bodegas Emilio Moro, and Austin Lam, Key Account Manager at EMW (East Meets West Fine Wines - distributor in Hong Kong), paid us a visit today to introduce the wines of Emilio Moro, potentially for our company restaurant "Dynasty Garden", thanks to Jameson Chim, the Sommelier of the restaurant. It was a very pleasant surprise as I love the wines from Bodegas Emilio Moro, which I have been buying for the last 16 years. In fact, I first discovered the wines of Emilio Moro during my years in New York back in 2002 while I was working as a Wine Consultant and Wine Buyer at PJWine.com, one of the largest and most prominent wine and spirits retail stores in Manhattan at the time (and probably still now). The owner and my boss, Mr. Peter Yi, with whom I have worked very closely during 5 years (2002-2007), was one of the pioneer wine retailers in the Big Apple to believe in and heavily promote Spanish wines. He was a wine lover, a smart and cunning businessman, and above all a Spanish wines aficionado. Besides teaching me a great deal about Spanish wines, Peter brought me along with him each year on a trip to France and Spain (with 1 or 2 more persons of the PJWine team). In fact, I was organizing his trips for him (making the appointments with the wineries, planning the days, mapping the roads to take and driving time, booking the hotels and restaurants along the way, as well as being his personal assistant and driver during the whole trip, even driving after each and every tastings and stop at the wineries, fortunately, I was spitting... it is important especially when you have a tasting with 300 wines to taste at 9am). Here is a picture I took back in the mid 2000s, during our PJWine annual trip to Spain. That day we were visiting Pesquera (Ribera del Duero). Alejandro Fernández and his daughter Lucía Fernández received us at the Bodegas, we visited the cellars, the vineyards and tasted the wines (which were amazing by the way). At the end, Peter, who loves baby lamb, asked Alejandro where we could find a good restaurant nearby where they serve baby lamb chops (or "Chuletas de cordero lechal" in Spanish). Alejandro said "You're going nowhere. I make the best chuletas around, stay with us and I will prepare some for you". Alejandro is a man of character and authority to whom you don't say no to, so we obliged the man 😊. In fact, Peter and I were ecstatic, as Alejandro asked us to join him a bit later in the afternoon, not at his home nor at the estate, but in his hut in the vineyards ("Cabaña" or "Choza" in spanish) at the top the hill overlooking the Ribera del Duero vineyards and valley. Alejandro prepared for us the best "Chuletas de cordero lechal" we ever tasted accompanied with a magnum of Pesquera 1985 or 1988 (don't remember exactly), while enjoying the view of the Ribera del Duero from the top of the hill. An unforgettable moment. 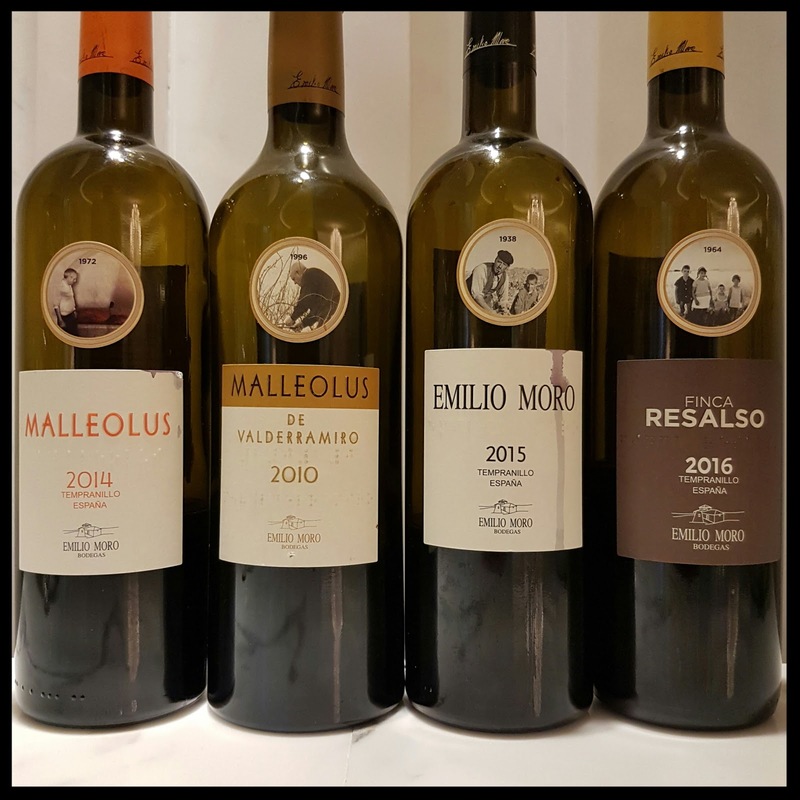 What a great souvenir..... but let's keep Pesquera aside for now (maybe in another post...) and let's go back to the original story and Bodegas Emilio Moro... which is by the way neighboring Pesquera as you can on the map. Prior departure, I was even creating an entire book, each year, with all the details (presentation of the Chateaux and wineries that we will visit, wine maps, itinerary, and endless amount of pages with the names of the wines to be tasted + space for the tasting notes and comments (I still have these books at home). It was fun and eye-opening, memorable and even unforgettable sometimes. I miss these trips. (Peter Yi, if you read this post one day, thank you for these 5 years spent working at your side and more especially for the opportunity to come along in these trips). We were usually heading to Bordeaux in France for the "En Primeur" tasting (end of March, beginning of April) for about 6 or 7 days, with a very busy daily schedule, visiting about 8 to 10 Châteaux per day, plus Négociants tastings and lunches and dinners either at a Chateau or a restaurant with a producer or with a négociant. 2 days in Saint-Emilion and Pomerol area. 1 day in the Graves. 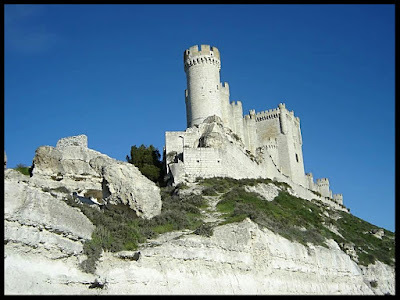 2 days in the Haut-Medoc. And usually, 1 or 2 more days with négociants. 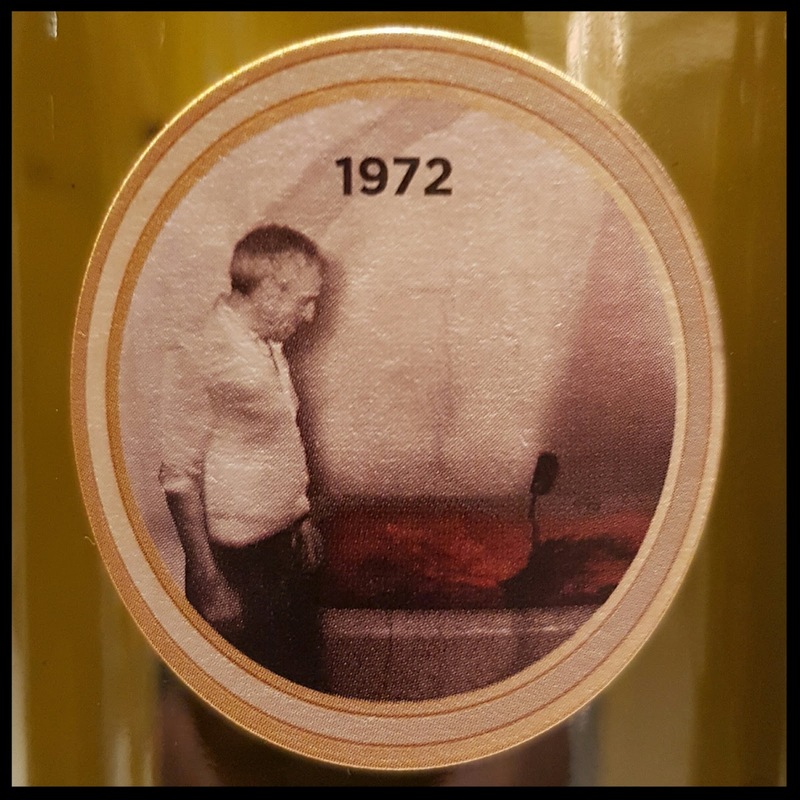 It was exhausting but thrilling at the same time, and really needed to have a clear idea of the quality of the vintage overall as well as per appellation and per producer. The "En Primeur" Bordeaux tasting is an enlightening experience that I highly recommend for those of you who never had the chance to do it. Then, once finished, usually drenched by the rain and tired of tasting Bordeaux wines (more especially that the En Primeur tasting week was notorious to be a rainy week with a crappy weather and disastrous road conditions as there are so many people going to Bordeaux during that week, that you usually end up in a long traffic jam at some point.... and most of the time under the rain...), we were heading south to Spain, hoping for a more clement weather and hopefully some sun. First stop was always San Sebastian, or more exactly Getaria, in the heart of Txakoli. Getaria is a beautiful little village located about 15 minutes driving from San Sebastian. It is a charming fisherman "Bourg" with three of my favorites place in the world: the Saiaz Hotel (quint with an extraordinary view on the bay of Getaria) and Kaia-Kaipe restaurant, specializing in grilled fish, especially the Turbo for two, which has one of the best wine lists for old vintage Rioja wines at bargain prices (but shh! it is a secret not to be revealed). The third one is a great restaurant, topping a cliff, with a beautiful, modern dining room overlooking the ocean, called Akelarre. The food is a fusion of Spanish and Basque cuisine with a "Nouvelle Cuisine" approach and price, yet it is definitely worth it, especially if you have a spare lunch on your agenda. There is a 4th place w were also going to, located in San Sebastian, which was probably my top favorite restaurant in San Sebastian at the time Arzak. Anyone should experience Arzak if going or staying in San Sebastian. These trips were a bliss not only in terms of wine but also food I must say. Beside his love for Spanish wines, Peter was also a food aficionado and loved eating great food, and I need to admit that I was very lucky to be there with him each year for 5 years. It was amazing to visit all of these wineries, meet the producers, taste all the wines, understand the vineyards by walking amongst the vines, realize the importance of the soils and subsoils as well as the environment, the vine's exposure and other influential factors, that are described in books but that one can only truly understand when seen with his or her own eyes. You can read as many books as you want on wines and vineyards, yet you will never get as much knowledge as when you take the time to go and walk in the vineyards listening to the "vigneron" who knows all their details by heart as it is the essence of his or her daily life, to the point that he or she nearly named each vine stock. So "en route" to Spain, Txakoli was only a pit stop on our path to Rioja, where like in Bordeaux our schedule was really busy, visiting 7-9 wineries a day with tasting, including lunch and/or dinner with producers and/or merchants. 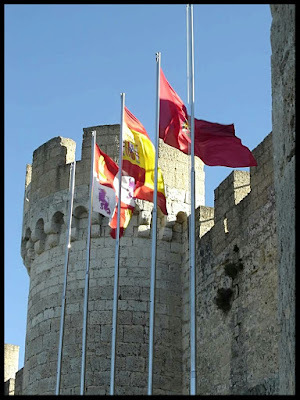 Although I'm French (French-American actually) and more precisely from Bordeaux and grandson of a winemaker in the Cote de Bourg, I see myself as a traitor to my own region of birth, as I love Rioja wines (and Burgundy, and Rhone, and Ribera del Duero, and so many other wine regions...). Generally, after a few exciting days in Rioja, visiting classic Bodegas such as Lopez de Heredia, Muga, La Rioja Alta, CVNE (Vina Real, Contino, Imperial), Roda, Vivanco Dinastia, Allende, Artadi, San Vicente, Contador, Marqués de Riscal, Marqués de Murrieta, Remírez de Ganuza, Ostatu, Baigorri, Ramón Bilbao, and a few more... we were heading southwest to Ribera del Duero, where it was also a fantastic experience each time we went there. 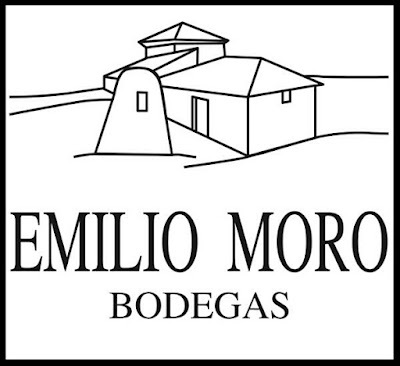 And that's how I came to visit Bodegas Emilio Moro for the first time back in the early 2000s. 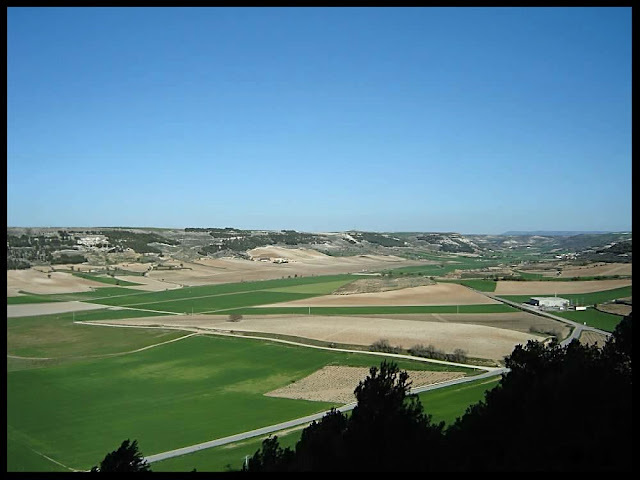 Ribera del Duero is an amazing place. It is a valley planted with vines on gentle slopes with good sun exposure along the banks of the Duero river. It is like a basin, where, much like in Napa Valley, the sun is strong and hot, and the earth is scorched every summer and the resulting wines are rich, layered, full, dense, generous and ripe with a lot of texture, structure and character. 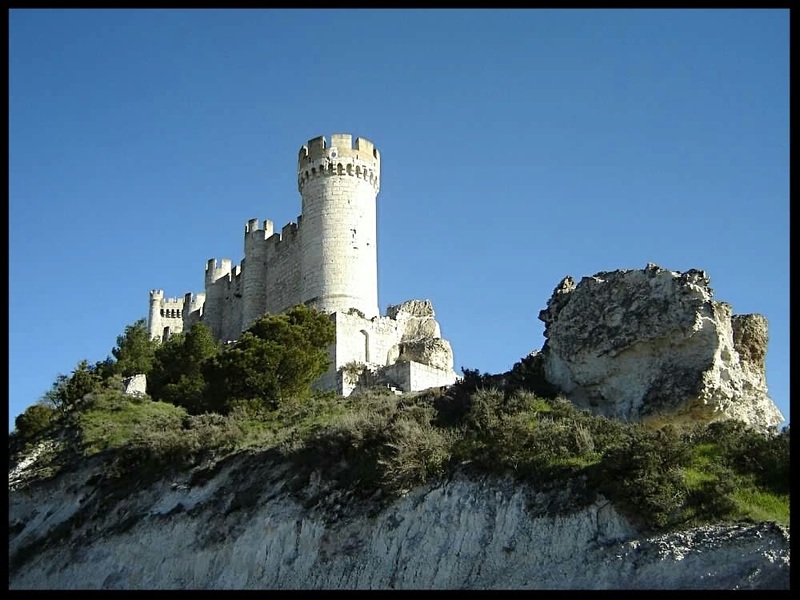 It is a place of history guarded by the Peñafiel Castle nestled on a rocky hilltop overlooking the valley and its vineyards. 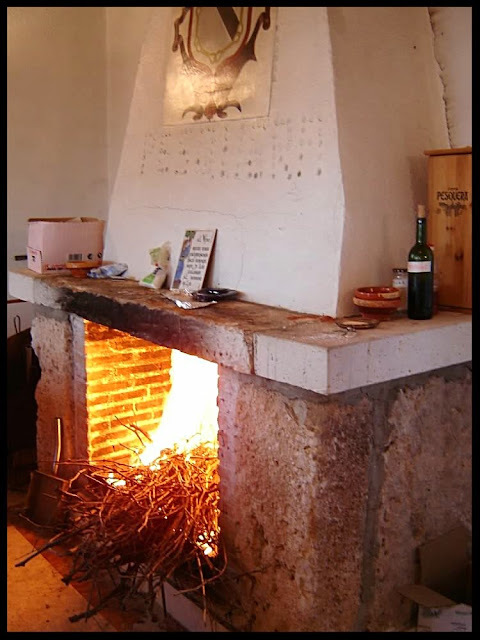 If you go to Ribera del Duero and if you like baby lamb (like Peter and I), you should go to one of my favorite restaurants in the world, called "Asados Nazareno", which is without question absolutely THE place to go for "Lechado" (roast baby lamb), located in the small village of Roa. They serve the most delicious roasted baby lamb I ever tried in my entire life. 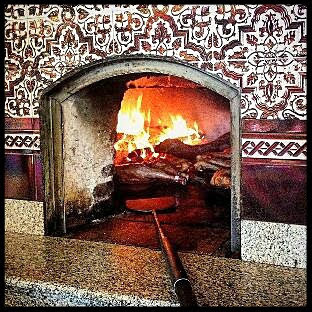 The place is like a cantina for the locals, known by all the producers and all epicureans, where you eat seating at table of 6-8 people (or more), in a large open space with mosaics on the back wall, wide windows and the warmth of the open fire in the brick ovens lodged in the back wall. Make sure that you call them 1 or 2 days in advance to book a table as it is nowadays even busier than back then in the early 2000s, and it could be difficult to get a table sometimes. 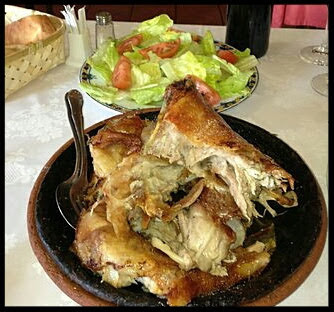 And before I forgot, when you call, you will have to let them know how many plates of "Lechado" you will eat per person, as they only prepare for what has been ordered. 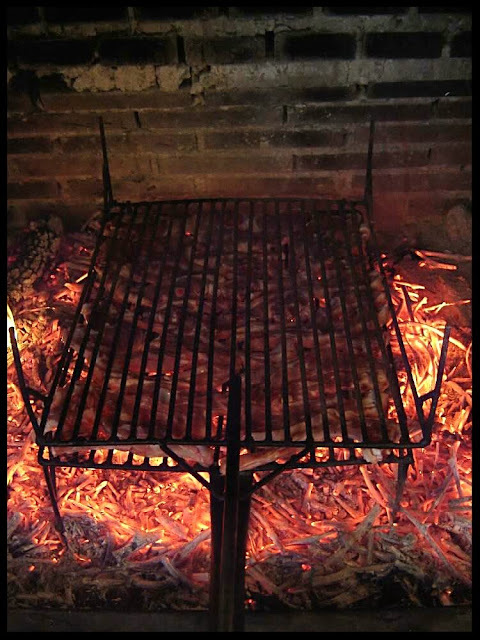 Asados Nazareno is definitely worth doing a little "detour" by Roa for the lunch when you are visiting Ribera del Duero. 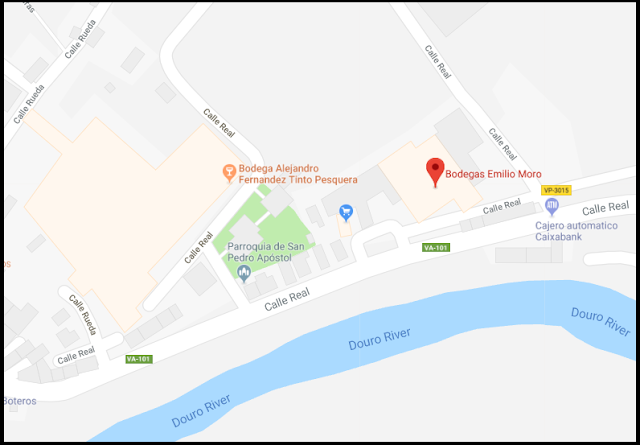 Bodegas Emilio Moro is located at the top of a bend in the Duero River in the town of Pesquera del Duero, just to the Northwest of Peñafiel (right by Tinto Pesquera as you can see on the maps above). 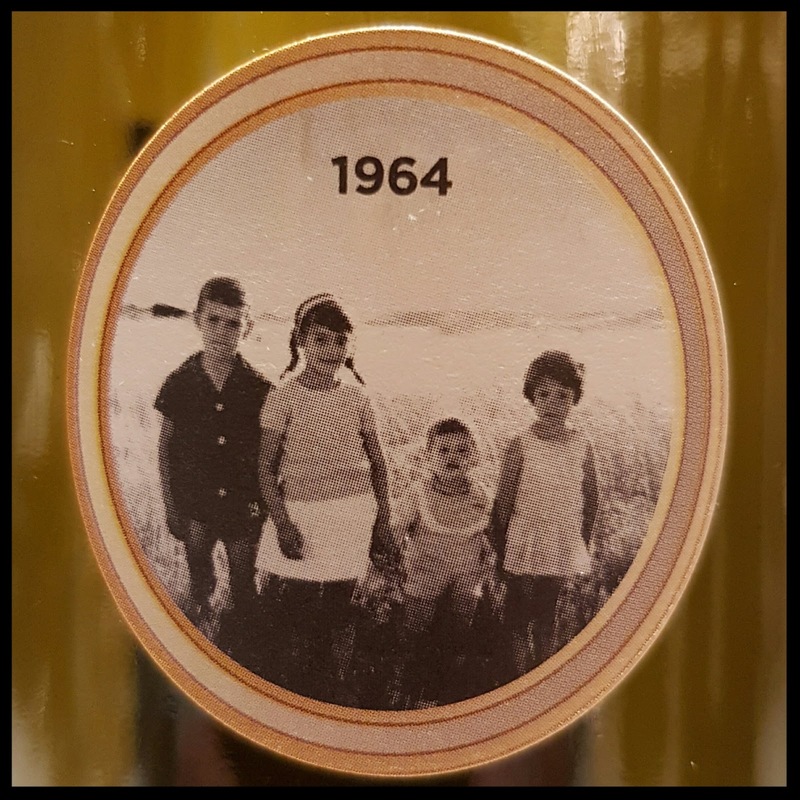 The Moro family has been farming the same vineyards in the Ribera del Duero since 1932, the birth year of Emilio Moro (the patriarch) as well as the year in which the Finca Resalso vineyard was planted. 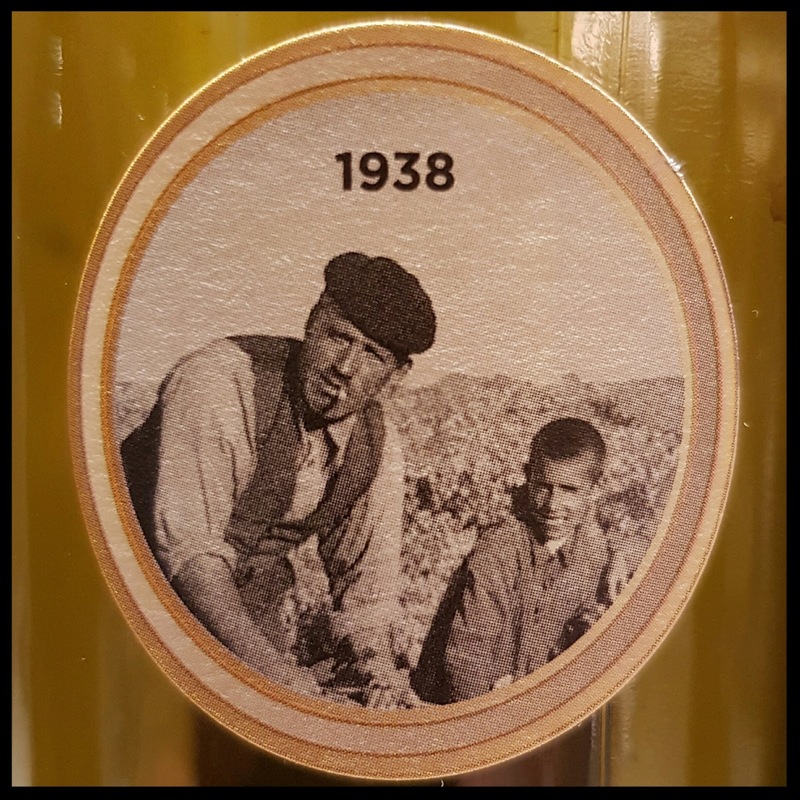 For two generations, the grapes were sold on the bulk market. 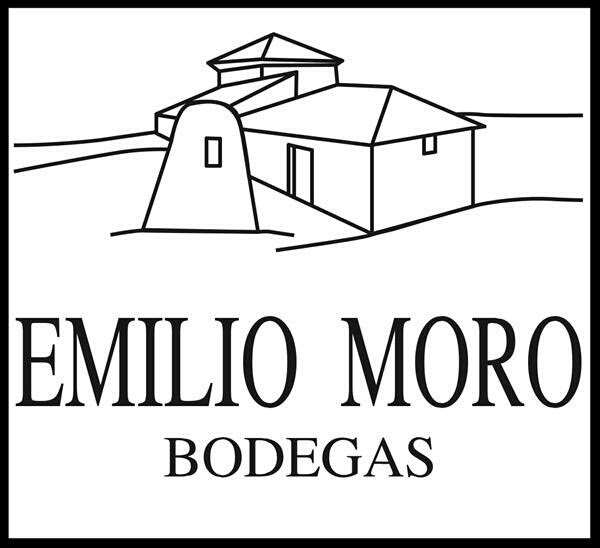 In 1988, current proprietor José Moro Espinosa invested the family’s entire savings into winery equipment and Bodegas Emilio Moro was born. The bodega joined the D.O. 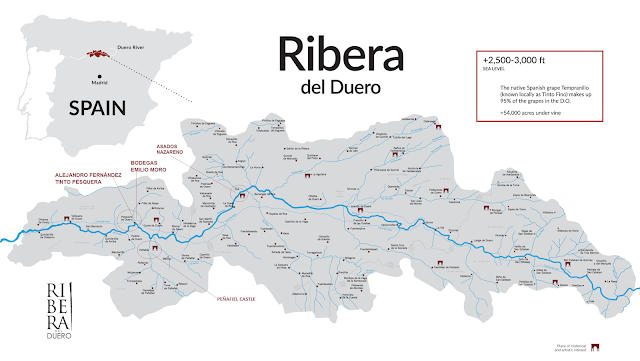 Ribera del Duero in 1989 and quickly established itself as one of the region’s leading producers of top quality wines. 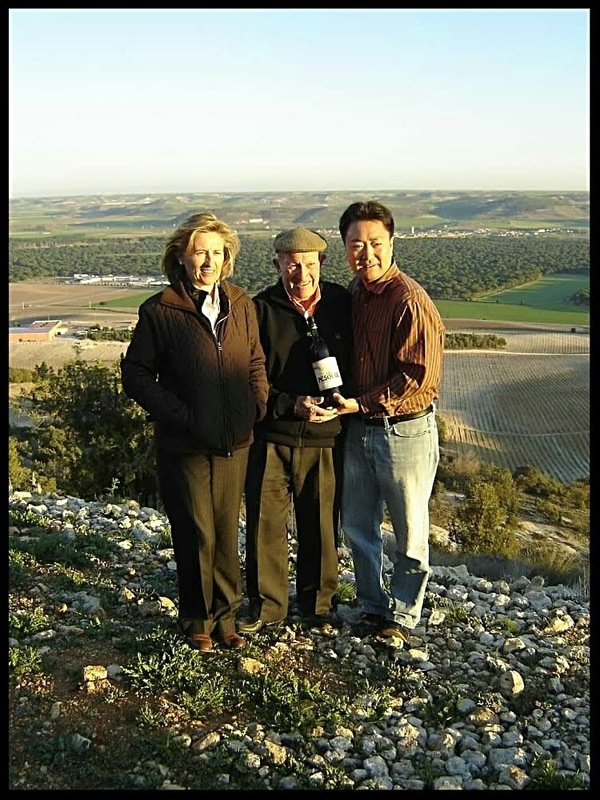 Nowadays the Bodegas is run by the two brothers Jose and Javier Moro. Bodegas Emilio Moro has a beautiful websites full of useful information (here), so I will now go straight to what I was supposed to write about, when I started what was supposed to be a little post 😊, the wines!!! 100% tempranillo macerated for 18 days on lees. The 2016 Finca Resalso is a very friendly, juicy, fruity wine with blackberry and currant aromas mingled with subtle hints of oak, good acidity and solid tannins, yet fairly well integrated, making this quaffable wine very approachable and enjoyable as a daily wine to pair with all sorts of cuisine. It is a really good value for money, and I was pleasantly surprised of its accessibility despite its young age for a Ribera del Duero wine. I usually prefer to wait a few more years after bottling before drinking Ribera wines, as they usually need a bit of bottle ageing to settle down, but obviously not this one. Definitely a "cash cow" if used as a wine by the glass in restaurant. 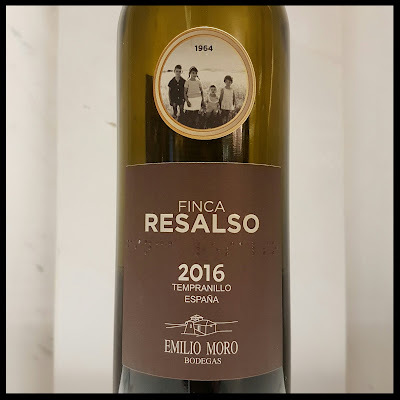 Interestingly enough, Finca Resalso is made out grapes from the eponymous vineyard first planted in 1932, yet, by contrast, the vines are only 5 to 15 years old. they must have uprooted the old vines for some reasons and replanted some until fairly recently. The youthness of the vines is nicely expressed into this playful and vibrant young wine profile and character. 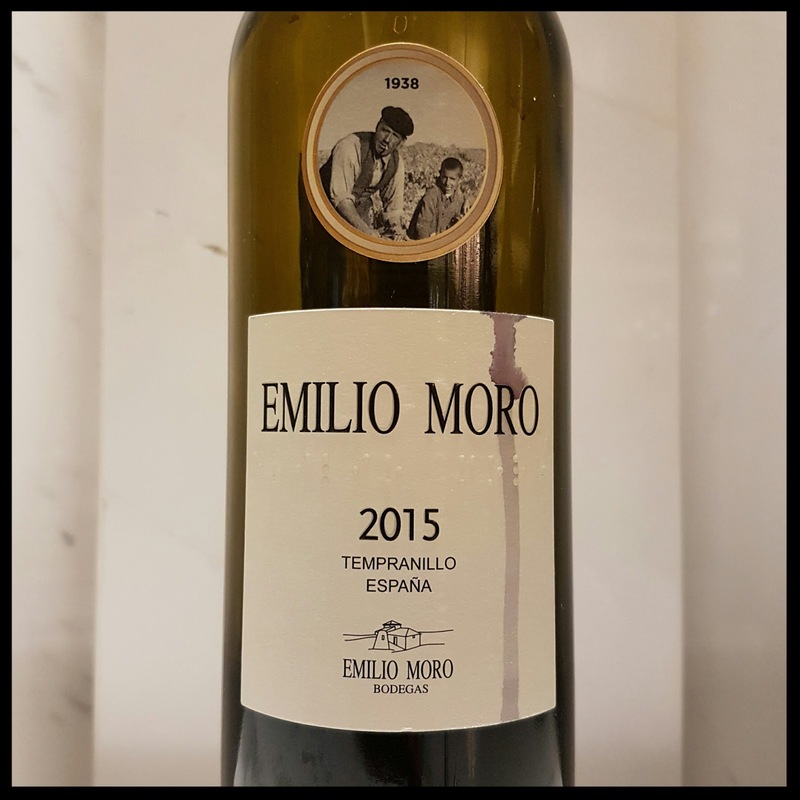 The founder of the winery is proudly displayed on the label of "Emilio Moro", as it represents everything Emilio Moro is all about, character, personality and complexity. Being produced out of grapes from 15 to 25 years old vines planted on soils representing the essence of three types of soil in the Ribera del Duero adds to the complexity and different nuances of this wine. 100% Tinto Fino grapes macerated with their skin for 15 days and aged in American and French oak barrels for 12 months, until bottling. 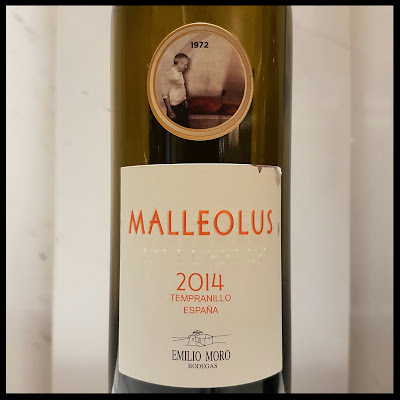 2015 is a great vintage for Ribera del Duero in general and it shows in this beautiful yet tight "Emilio Moro". Although the bottle had been opened for quite a few hours, the nose appeared a bit muted at first (to me) and took a few swirls in the glass to be more expressive and get more intensity. Fragile, subtil aromas of red and black berries with nuances of tobacco, leather, herbs, earth, spices intermingling with the toasted oak notes on the nose. Although boasting very enticing fruity, earthy, leathery and toasted flavors, the palate is still tight and youthful, yet nicely layered and complex, with a good balance overall between the acidity and the ripe fleshy tannins building a solid structure and texture with plenty of concentration to make it a great wine. Yet again, the tight grip of tannins and touch of alcohol in the back palate will demand a bit of time to round up and get better integrated. This medium to full bodied wine shows a lot of potential to evolve greatly and become one of the stellar of the appellation in this price range, yet it is still too young to drink now in my opinion and will definitely require quite a few more years of ageing in the bottle to be more harmonious and round up some of the edges. If serve now, some decanting time will definitely be needed for it to reveal itself on the bright side. Otherwise always a good value for money in my opinion. 100% Tinto Fino grapes. 18 days maceration on lees. The malolactic fermentation occurs in French oak barrels, after what it then aged for 18 months in Allier French oak barrels. Wow, what a beautiful nose, extremely fragrant, complex and layered with tons of aromas, opulent and intense. I kept going back for it. In fact, I was enjoying the wine just by smelling it. Surely the range of 25-75 years old vines and the diversity of the soils have something to do with it. Aside from the classic scent of the Tinto Fino beautifully expressed in this wine, the nose also combines aromas of blackberry, ripe dark currant, chocolate, nuts, toasted oak, leather, balsamic, herbs, spices as well as mineral and floral hints. On the palate, the attack is fresh, generous, soft and supple, and gradually increases in intensity and power in the ample mid-palate, with layers of complex flavors leading to the refined, integrated and long lasting finish. Even minutes later, I was still chewing the ripe, mature yet very well integrated tannin (need some red meat with that). 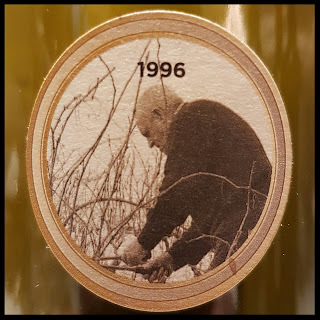 This wine boasts a combination of freshness, concentration, harmony, balance, texture, structure and length with plenty to offer for quite a few years to come. It is said that Malleolus is the quintessential expression of Emilio Moro style and terroir expression, and it definitely shows in this wine. And once again, a bargain compared to some of its peers from the same Appellation. Highly recommended. 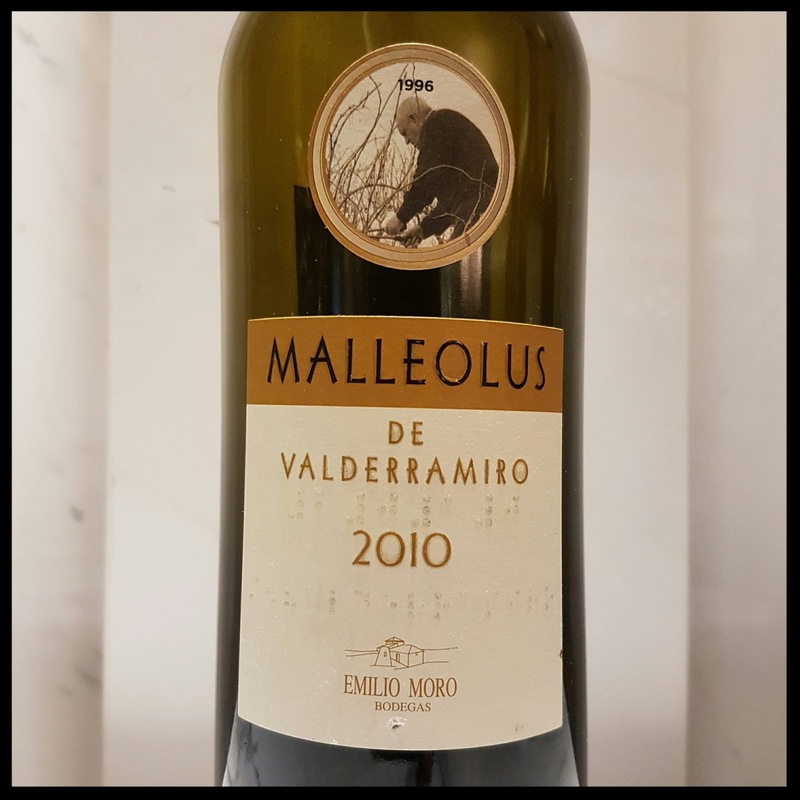 Elaborated from grapes harvested in the Valderramiro vineyard, which was planted in 1924, Malleolus de Valderramiro is the expression of the terroir that surrounds it. 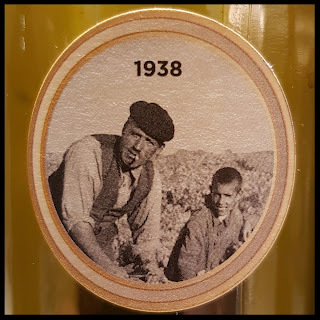 In the label we can see Emilio Moro during the pruning process in one of the oldest vineyards owned by the family. 100% Tinto Fino grapes. Malolactic fermentation in American oak barrels then aged for 18 months in French oak barrels. There again a beautiful nose, not as fragrant or intense as the previous one, yet enticing with primary and secondary aromas/bouquet of dark ripe fruit, figues, tobacco, leather, roasted coffee, smoke, smoked earth, game, underbrush, forest floor, spice, liquorice and toasted oak notes. The palate is rich, quite intense and complex, ample and coating, yet elegant and refined at the same time with the same flavours as on the nose, yet more intensified. Long beautifully balanced, structured and textured finish with a good dose of integrated yet present tannins and persistent reminiscence of smoke, earth and mineral in the back end. Although it will still well be alive for another decade or two, the wine shows some interesting secondary aromas and flavors that give it a dash more of depth and complexity. It is the type of wine that I have no problem finishing the bottle on my own. The few sips during the tasting (and because it was the last wine) definitely called for a proper glass (glasses I meant...😊). Highly recommended. Voila, that is it for today..... 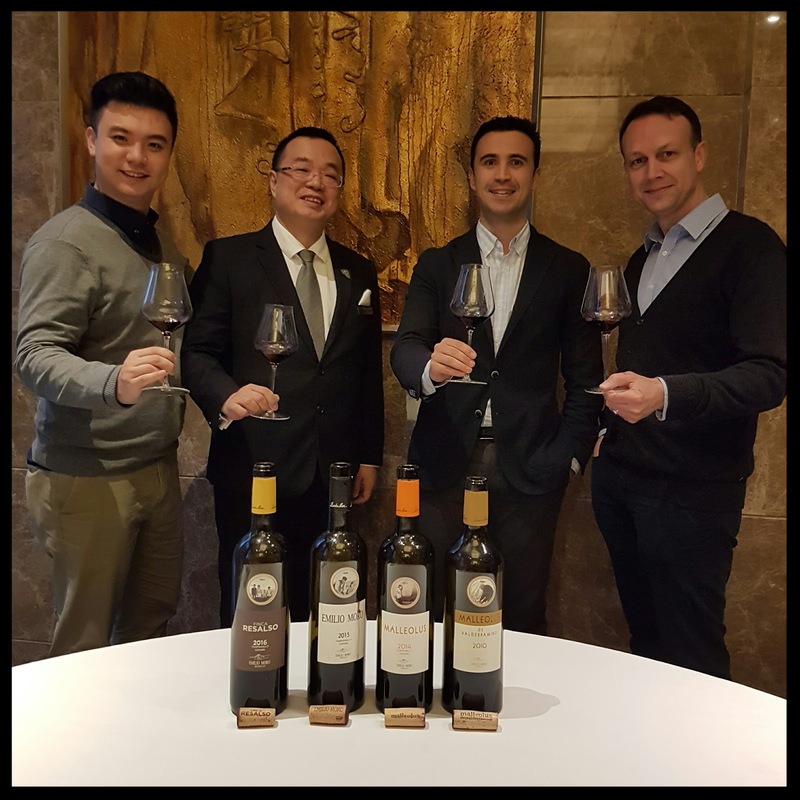 Thank you again to Nacho Andrès for introducing the wines and to Austin Lam for visiting our Chinese restaurant Dynasty Garden and bringing such gems like these along with you. Santé, cheers, and stay tuned for post like this one soon.